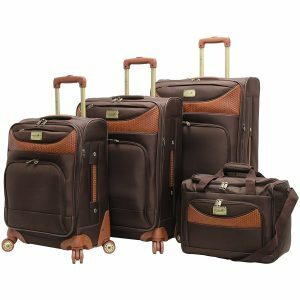 Caribbean Joe Castaway (J2671) is a soft shell luggage set of 4 pieces with a sleek and modern design and a sturdy construction. It is a very popular best seller travel product with a rating of 4.5 out of 5 stars by 128 customers. The set is made of three pieces of 20″, 24″ and 28″ spinner suitcases as well as a tote bag. You can order it in chocolate (J2671-26-4p) or olive (J2671-35-4p) colors, both with the same price tag. And both are distinctive colors and should be easily identifiable on the luggage carousel at the airport, but olive color a bit more so. The durable and lightweight 1680D Polyester material is used on the soft shell exterior. 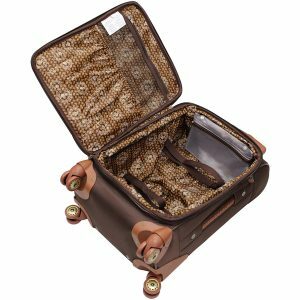 The suitcases come with the 360-degree rotating double spinner wheels and the push button locking telescoping handles. So you can pull or push them with a single hand. They have the full interior lining, small mesh pockets on both sides and elastic straps. They have the large Caribbean Joe signature logo at the front. The tote bag measures 12 x 18 x 10 inches and the smallest carry-on bag measures 20 x 14 x 8 inches (without the wheels or handles). And they are both good for use as cabin bags to be taken on board. The tote bag will fit under the seat in front of you and you can put the cabin suitcase in the overhead locker just over your seat easily. It was actually tested extensively to fit in the overhead bin in most airlines. 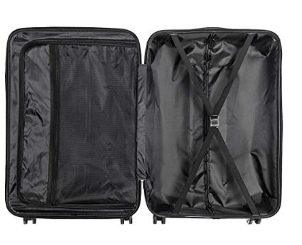 The medium size 24″ suitcase measures 24 x 16 x 9 inches and the largest 28″ suitcase is 28 x 18 x 10 inches. You obviously can’t use them as cabin bags and need to check them in at the counters before going through the security check and boarding your plane. All of the four bags will fit into each other very easily for storage purposes. And you’ll get them all in one piece, tote fitted into cabin, cabin into medium and medium into large suitcase. The tote bag weighs 3 pounds, the carry-on bag 7.8 pounds, medium suitcase is 8.9 pounds and the largest one weighs 10.8 pounds. You can use the tote bag for your toiletries or other small items and put it on one of the wheeled suitcases. The zippers are good quality and very sturdy. Interestingly you won’t get any locks or ID tags on these bags. How much they will weigh will naturally depend on how heavy the stuff you put in them is. But no matter how heavy the large suitcases become they will be very easy to manage with the solid spinner wheels. For how much they cost, these are awesome bags with great build quality, beautiful looks and functionality. This set is made in China as most products you purchase these days. And this is by no means an indication of low quality as all sorts (very high and lower quality products) are manufactured in China. 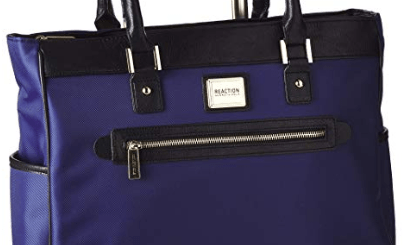 There is no handle at the bottom of the largest suitcase, but an indentation that could help lift it easier and all three bags have the solid side and top handles. They are rather reasonably priced for what they are and we don’t hesitate to recommend them.